Fairmont Le Chateau Montebello is an exceptional star-shaped red cedar log chateau and is one of eastern Canadas leading destinations. Situated on the shores of the Ottawa River with acres of beautifully landscaped lawns this property is a gateway to year-round family adventures. SPA: A 4.000 square foot full service Fairmont spa. Located adjacent to the indoor pool and fitness center - the facility features 3 manicure and pedicure stations and 8 treatment rooms including a couple suite. Fairmont Le Château Montebello is undergoing renovation to debut our rooms and suites transformation. Guests may encounter noise disturbances and minor changes on site between 8:30 a.m. and 4:00 p.m., Monday to Friday. We thank you for your understanding. Come and have a unique dining experience at Fairmont Le Château Montebello. Enjoy the tranquility of the Ottawa River and the beautiful gardens while enjoying a gastronomic feast in our Montebello restaurant. Our Bistro La Seigneurie serves up great bistro fare in a trendy yet friendly atmosphere. Savor local flavors and traditional inspired recipes brought to you with a modern twist. After a great round of golf, enjoy a cool drink on our terrace. A light bistro menu is also available before or after your round. A food cart also makes its rounds if you can't wait to get out there and a light snack is what you are after. Come and enjoy a unique experience at Château Montebello's famous BBQ. Our facilities, including a magnificent tent and heating system, will make your dining experience memorable. On a sunny afternoon, take it to our outdoor eatery at Le Riverain to savor a variety of casual recipes. Enjoying one of our signature cocktails paired with a delicious tasting board or sipping on our Montebello 'special coffee' while reading in one of our easy chairs is better than home sweet home! Hours 13:30 - 20:30. The staff was very nice. Two things were disappointing. The fact that the tunnel to the pool was closed amd the other thing was the buffet were the hot food was served was not hot, so I was very disappointed. Nice atmosphere but staff were generally unfriendly. We loved sitting around the fireplace playing cards and having a laugh. Our rooms were great, clean and although dated they were charming. The food was ok.. but buffet style tended to get cold quickly. There was lots of choices. The pool and hot tubs were old but again in keeping with the general ambiance of an old fashioned lodge... we enjoyed lounging in the hammock. The staff were helpful but not very personable... I felt it was due to the fact that we were English speaking guests... I hope I was wrong about that! We were part of the Ladies Getaway Weekend. I treated my Mom for her 87th Birthday and invited my sister along. Service was excellent, food amazing, house keeping was so friendly -overall an excellent weekend. Good. Food wasn't great. Drinks are too expensive. we enjoyed our stay with the accommodations by we felt there was a lack of attention to a suitalbe age range for the event we planned to attend with women between24-26 to 58-60? in our party yet it was geared to only the oldies - this is something the host needs to promote as an over 40+event to avoid such disappointment. It’s a very quaint lovely place for a weekend. Spring had finally and it was nice to have sunshine. My daughter and I usually go once a year (missed in 2018) and have a lovely time. We were disappointed that that there wasn’t any live music in the bar this time. I was happy with room and the facilities. The food was excellent. I came for a family law conference. I want to come to visit with my family! I loved it! It was satisfactory- a lovely charming hotel. Unfortunately it was under renovation and therefore the room stay was somewhat affected. I realize this is temporary. Lovely. The food and service was superb! and the room was very comfortable and clean! Arrived early and was upgraded from Queen to King size without charge. Mentioned that it was my granddaughter's birthday and the staff surprised us with complimentary birthday cupcakes. Excellent meals! Wonderful pedicures at the Spa. Land Rover experience fun, hotel was lacking. Love the rustic and cozy atmosphere and the availability of many activities. We arrived late and hungry on a Saturday night. Unfortunately the kitchen was closed but they were just cleaning up and offered us to make us a charcuterie board which we enjoyed in front of the fireplace with a glass of wine. This was much appreciated. The next day, we had a spa treatment which was wonderfully relaxing and we played squash. The entire staff from Marc as we pulled up to the front entrance, Laurent at check in, Diane and Nicholas for an upcoming reservation made us feel so welcome. As soon as we pull off the highway and go through the arch way, we feel so relaxed. The entire staff makes us feel like we are special guests at the Chateau. Marc assisted with our luggage, and after i returned from the parking lot, he had checked with Laurent to see if our room was ready. Laurent checked us in promptly, and was extremely courteous. Marc brought our luggage to the room, set things up, and asked if we were happy with our room. We were thrilled. Josee in housekeeping made sure that our room was clean, and was always cheerful and greeted us when we were in the hallway. An extremely professional staff. Sylvain remembered us from previous stays, and made our dining experience exceptional. As I stated earlier, Diane and Nicholas were most helpful and took time to assist us with a reservation in the upcoming New Year. We really can't say enough about how we are treated. I was there for business. The place is very lovely, relaxing and unique. Hotel staff was very polite and helpful. Food was great. 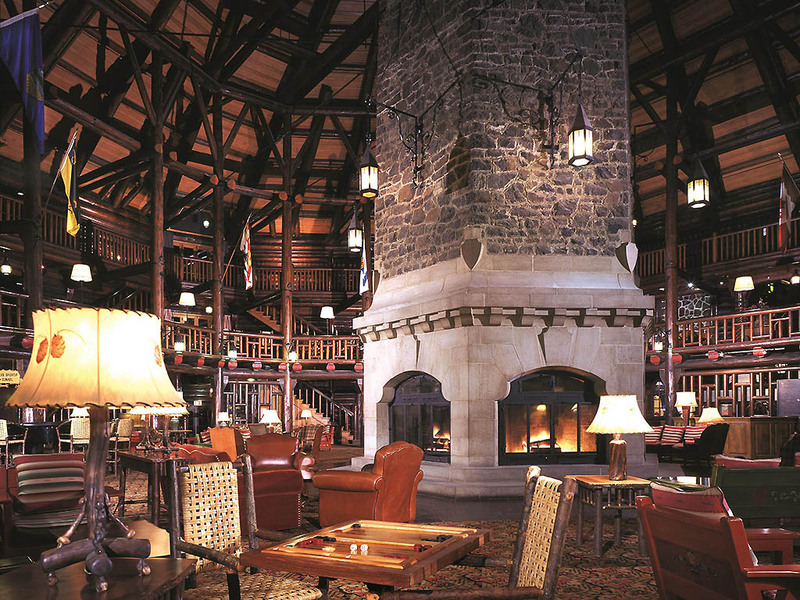 We love the Chateau Montebello, especially sitting by the fire! My wife adores the pool, I love the fireplace. We must return when the golf course is open. That said, the winter hikes are wonderful. The hotel is beautiful, the staff are fantastic and food is fabulous. I guess I didn't do all my homework. It was not a major issue, I would have likely delayed our little get-away trip here by another year in hopes we would get one of the newly renovated rooms. It looks like they are running behind since the 2 wings they are working on were seemingly supposed to be done by Dec 2018... we are in Apr 2019 and they are still on-going. This delayed should be advertised as some patrons may expect a newly reno'd room. I booked a jacuzzi suite. It was great, roomy, clean. It was however dated, and the chairs and couch weren't that comfy to sit in to watch tv. The duvet cover had a weird stain, looked like wine. Nothing major. Service was excellent over all. Staff was friendly and helpful the few times we had questions. No problems getting the wifi. We felt the value was a little on the low side. We stayed at hotels that were a little cheaper, yet had nicer rooms. I suppose there is a rustic and location premium to take into account here. Assuming prices don't skyrocket following the reno, we will likely go back again. We also went to the SPA for a massage. It was enjoyable and relaxing and had a few nice perks. I would have sat outside on the deck since it was a nice April day, but all the chairs were taken up by a group of young ladies and they didn't seem in a rush to leave. Maybe in the summer months they have more than 4 chairs out there? We ate dinner at the Aux Chantignol restaurant which was an OK experience, had small issue with the main dish, again value was a little on the low side. But I still recommend it. Brunch was great also (same restaurant). I do recommend the hotel, but maybe wait until 2020, when hopefully all renos are done. Hopefully they do not decide to up the prices too much.